A report on the economic benefits directly accruing to the Borders from the construction of the £354million railway linking Tweedbank to Edinburgh will be presented to councillors this summer. This comes after a wait for essential information. Councillor Stuart Bell, Scottish Borders Council’s executive member for economic development, commented: “There has been a bit of a problem getting Borders-specific information because the construction project is not yet completed. However, Mr Bell told last week’s full council meeting that the wider benefit of the construction of the railway, due to open in September, was already evident in the £82million worth of contracts which were awarded in the project’s first year – from April 2013 to April 2014 – of which 21%, worth £18million, had gone to companies with a base in Edinburgh, Midlothian or the Borders. He said 148 (40%) of the sub-contractors had been Scottish companies and that, at peak construction, 1,100 employees had been working on the line. 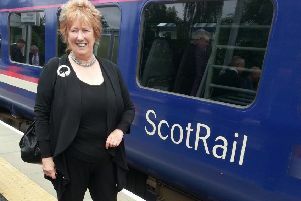 Ten of the train drivers recruited by Scotrail were from the Borders. Regarding the future, Mr Bell cited the Scottish Government-led Borders Railway Blueprint, a two-year funding programme to push up the wider economic benefits by ensuring the line stimulated investment, business growth, new employment and an increase in visitors. Meanwhile, the relationship between the railway and bus services across the region will be the subject of a separate report to councillors. Councillor Gordon Edgar, executive member for roads and infrastructure, told last week’s meeting that while trains would link the central Borders with Edinburgh, it was important other public transport connections were maintained and, if possible, improved after September. He said: “The council has no plans to reduce the frequency of its current subsidised bus network, particularly for those communities outwith the central Borders. He said a report would be presented to councillors “in the near future”, setting out the connectivity of all different modes of transport with the railway.